It was another early start from London, 5:30am to be on the road for 6am... The drive up to Pidley in Cambridgeshire was easy given the time so I arrived at the Mad Cat Pub for our breakfast gathering with plenty of time to spare. Colin Mercer was already at the pub car park having stayed over after a two day event close by. The weather was glorious and there had been talk that the carp had been spawning on the saturday which made the fishing tough going for those competing with weighs well done on the normal 100-200lb bags! Bury Hill Fisheries is one I've heard about a lot. Russ Evans, The Obsessed Angler used to be the head bailiff with plenty of videos to be found on YouTube. I was looking forward to this match where the main species to target is Bream. 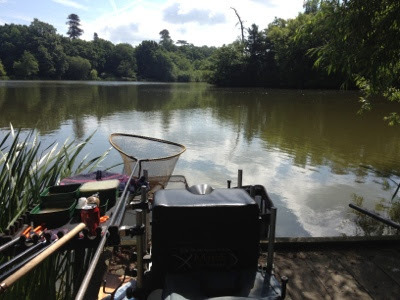 I contacted Russ to get an idea of how to approach Bury Hill and he gave me some good advice about the pegs, what groundbait to feed and to be prepared to chase the bream further out as they tend to back off.